You can choose networks over which Veeam Backup & Replication must transport VM data when you perform data protection and disaster recovery tasks. This option can be helpful if you have a non-production network and want to route VM data traffic over this network instead of the production one. To define networks for data transfer, you must create a list of preferred networks. When Veeam Backup & Replication needs to transfer VM data, it uses networks from this list. If a connection over preferred networks cannot be established for some reason, Veeam Backup & Replication will automatically fail over to the production network. 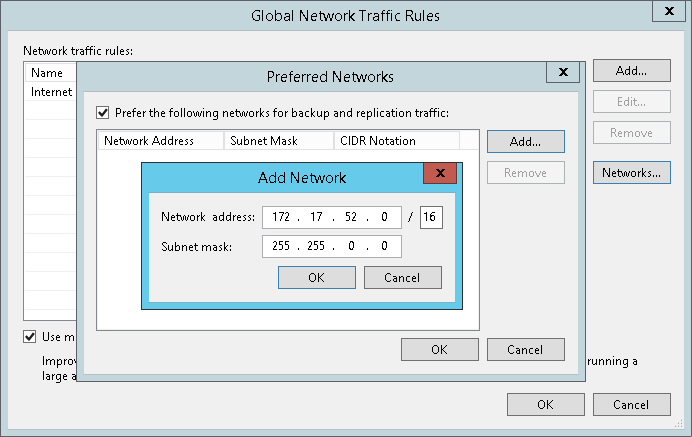 Specify a network address using a CIDR notation or a network mask and click Add. Repeat steps 4-5 for all networks that you want to add.